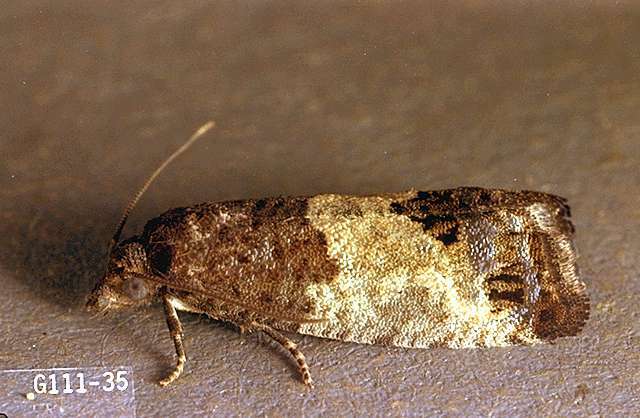 Pest description and crop damage Adults are grayish moths about 0.4 inch long with a wide white band on each forewing. Larvae are chocolate-brown with black heads, and up to one inch long. The larvae feed on terminal growth and on the surface of the fruit and can also feed on blossoms early in the season. Biology and life history Larvae spend the winter in a cocoon on the bark in the crotches of small-diameter limbs. They become active around budbreak and feed on leaves and buds, webbing together leaves and feeding within these nests. After feeding, they pupate within the nest and adult moths emerge in early-to-mid summer. Eggs are laid on the lower surface of leaves. 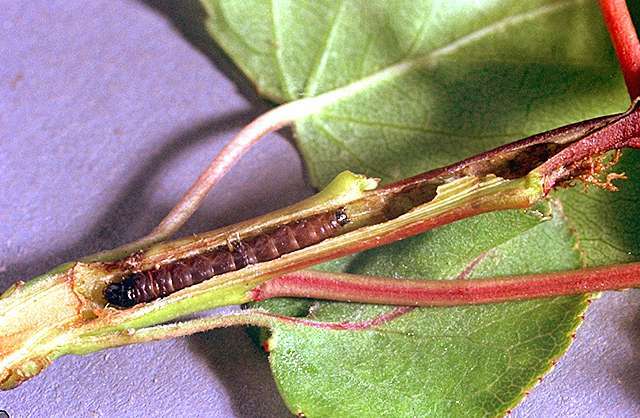 The larvae emerge and feed on the lower leaf surface until early August, at which time they construct their overwintering cocoons (hibernacula). Pest monitoring Look for larvae in nests of webbed-together leaves in the spring. chlorpyrifos (Lorsban 75WG) at 2.0 to 2.67 lb/a. REI 4 days. Do not exceed one application of chlorpyrifos as a dormant or delayed-dormant per season. Avoid contact with foliage in sweet cherries as premature leaf drop may result. Extremely toxic to fish and aquatic invertebrates; avoid spray drift and runoff to surface waters. Do not exceed one dormant application per year. methoxyfenozide (Intrepid 2F) at 8 to 16 fl oz/a. REI 4 hr. PHI 7 days. Apply when egg hatch begins or at the first sign of larval infestation. Do not apply within 25 ft of an aquatic habitat, 150 ft if applied by air.